Есть вопрос для Sathu Boutique House? Sathu Boutique House, расположенный в Старый город, Чиангмай, это популярный выбор среди путешественников. Всего 0.5 km отделяет отель от центра города, его удобное расположение позволяет гостям отеля быстро и легко добраться до многих достопримечательностей. Благодаря удобному расположению, отель предлагает легкий доступ к наиболее популярным туристическим местам в городе. Предлагая гостям превосходный сервис и широкий спектр услуг, Sathu Boutique House стремится к тому, чтобы сделать ваше пребывание в отеле максимально комфортным. Проживая в этом прекрасном отеле, гости могут воспользоваться такими услугами, как бесплатный Wi-Fi в номерах, Wi-Fi на территории, обслуживание номеров, трансфер, ресторан. Кроме того, номера оснащены различными удобствами, такими как телевизор с плоским экраном, Wi-Fi (бесплатный), кондиционер, услуга будильник, мини-бар, чтобы удовлетворить даже самых взыскательных гостей. Внешний бассейн предлагаемых в отеле, помогут вам идеально отдохнуть и расслабиться после напряженного дня. Получите истинное наслаждение от первоклассных услуг и элитного расположения Sathu Boutique House. В данном объекте размещения установка дополнительных кроватей не предусмотрена. Хорошее расположение, есть небольшой бассейн, приветливый персонал. Хорошее расположение, есть небольшой бассейн, приветливый персонал, бесплатный Wi-Fi. There are too many negative comments here. People's expectations when booking a "Boutique Hotel" are far too high. Boutique means small. Do not expect a massive marbled toilet/shower, but yes, The Sathu could do with an upgrade to their shower/toilet. Functional there are with hot/cold water, and really that's all I require as I have no desire to spend the day in there. The pool is indeed a "plunge pool," and having said that, it's a lot better and larger than a few places that I've been to who list a pool that turns out to be a jacuzzi ohotographed with a fisheye lens! The manager was courteous and attentive, as were the staff. Just remember, location location location. You cannot fault the location of this pretty boutique hotel. It's a five minute walk to the markets and many many restaurants. Life is a compromise. If you want large rooms and toilets and marble floors then best stick to the Hiltons and Shangri La's! We stayed at Sathu for 3 nights and the location it excellent. Everything is on your door step and you really get th city experience. The hotel is lovely and it was good value for money. We didn't eat here so cannot comment on the food. The pool is tranquil and nice. The room was clean and spotless and the staff are friendly and spoke good English. However the rooms are quite small, we stayed in a "superior" room and it was very small but we didn't spend that much time in the room anyway, there's a city to explore! Good location and nice enough. We expected a little more for the price. The room was very small and there wasn’t much atmosphere to the place. But it was nice to have a pool and we enjoyed being in this area. The bathroom, as far as this word can be used, is very small and not according to the price that must be paid for the room. It was not difficult to find another hotel with better quality for two third of this price. Nothing good to say about this place. Requested to be picked up from the airport. they didnt turn up and didnt advise either. The most awful thing being the shower/toilet. Literally on top of each other. It is dirty, smells bad. i checked out immediately. off course they didnt refund a single cent. It bursts with charm but the odor was annoying. Had moldy or bug smell. I'm not that sensitive but this you couldn't let go. Service was good. Breakfast...a little lame. It could be great with a little attention to detail. Cannot fault the location and the rooms are what you pay for but if you are a light sleeper it won't be for you. Every morning the restaurant starts scraping the chairs on the ground and the walls are paper thin so can hear every conversation in rooms either side. Lovely, well thought out & designed hotel. The staff is friendly, but instead of an actual taxi for my drive back to the airport, I think they got one of their friends to drive me. The bedroom was small but well furnished, and the bathroom did take some getting used to with the shower head being right next to the toilet, but this is common in Asia. I did not eat there or use the pool. This hotel is far from 4 star! Upon arrival the owner/manager tried putting us in a room with a double that had stains all over the linen.We asked for room with a bigger bed, he said didn't have.We took a room with two singles,the size of a closet with rock hard beds.The bathroom was a toilet/ shower combined. Very unaccomadating to guests! 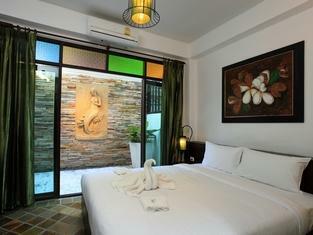 Don't waste your time or money,far better hotels in Chaing Mai for the same $!! We really enjoyed our stay here. It's very nicely decorated, the location is fantastic, and the staff were very friendly and helpful. Yes, as others have noted, the rooms are small, and the bathrooms are wet rooms with the shower head next to the toilet. If you want a large American style room, then you should probably book in a high rise hotel near the night market and river. But, if you want to stay in a small, lovely guest house in a great location, I definitely recommend Sathu. Staff would sneak in, and check if you have turn off all electricity, else they would do it. I find that intrusive, room are too small for that price point. Else location is not bad, it's pretty quiet. 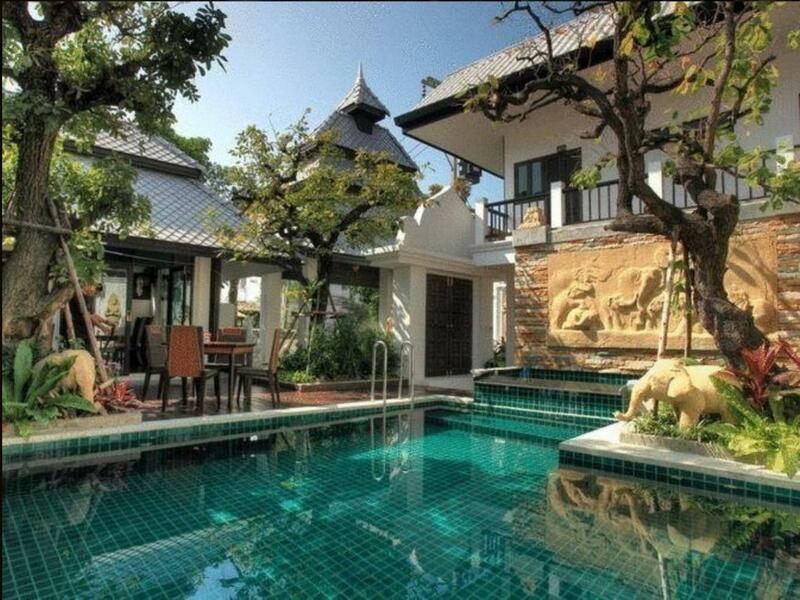 The Sathu Boutique House was a little more expensive than surrounding guesthouses and hotels. The rooms were standard and clean and the pool area was very nice. I was traveling in a group of 30, most of which were staying at a hotel down the road. I had booked two rooms for the remaining 5 people we couldn't get at the hotel down the street. When we went to check in the front desk woman informed me that there were only two to a room. When I explained to her I booked it for 5 and the extra person didn't mind staying in the room anyway she became very defensive and told me no more than 2. After trying to explain to her that we were in a large group and would need to be in and out of the property she became very upset and would not let any of us back on the property unless one of the 4 staying there. It was unnecessary and she was beyond rude to me and the rest of my group. I would not recommend this hotel. For the same price , if not less there are a ton of other guesthouses and hotels in the area. I was disappointed to be honest. I booked a delux room at a price comparable with other hotels in the Night Bazaar areas. However, the room was not much bigger than the small double bed that was inside it. I had no space whatsoever to move around, which meant that all the time I spent in the room, I had to basically stand by or lie down on the bed. The room was less than half the size of the ones I got in the hotel at the Night Bazaar. I won't go back. All in all a pleasant stay although my 2 friends and I were all disappointed by the size of the pool - the pictures make it look like a proper swimming pool but it's little more than a plunge pool. Nice for warm days and the area around the pool was pretty but the pictures are a little deceptive. There was also only 1 sun lounger which we had to sit on in a row! Rooms were clean and the decor/general feel of the place was nice. The woman who was mostly on reception was not over friendly and another guy who was in the reception area one afternoon saw us looking at some of the flyers for trips and treks while we were chilling by the pool and got quite pushy in trying to sell us an elephant trek even though we repeatedly explained we were just looking. Don't get me wrong, it's a nice place but the photos definitely make it look more like a lux boutique resort when it's actually a guesthouse tucked away down a soi. Our experience was bad from the first few minutes. The check-in process was impersonal, notably every minutae detail in passports was copied and annotated, e felt like we were undergoing a police/immigration inspection. We accepted a twin room because we arrived too early for our Superior Room (no fault of the hotel), but there was no effort made to move us to the better room during our stay. We had paid for a higher grade room and this should have been granted to us after the first night in the twin room. The twin beds were pushed together in a manner that made sleeping uncomfortable, bordering on impossible with the extremely thin walls and proximity to neighbours. The room was small, poky, and dark. Hardly inviting. We decided to take it upon ourselves and leave 2 days early. The checki-n staff wasn't interested the slightest - reflecting our entire experience at this place. We had a great stay at sathu boutique house. The location was great and the staff were friendly and helpful. The one downside in our superior deluxe double room was the shower was not separated in the bathroom so when you took a shower EVERYTHING, including the toilet, got soaked. Small downside in a affordable hotel though. Would visit again!